So far this week, I don’t have much I’m able and/or willing to show the world from my sketchbook, so I thought I’d take this opportunity to talk about a recent life-changing event that has helped shaped my identity as an artist. 29 years ago, 2 months, and 15 days ago (give or take 8 days for leap years), I was born. I was brought home to the most loving family: a strong older sister, a peaceful dad, and an extraordinary mother. From there you can read my bio and get the abridged version of how the next 28 years went. About halfway into 28, as I was struggling daily to teach Algebra to teenagers, Laura and I found each other. The last time I had seen her was on my Zeroth birthday; she is my birthmother. I believe a tendency for creating art can come from anywhere and everywhere, but finding out that I had it in my DNA was validating for me. It helped make sense of the subtle, but constant pull I’ve felt to express my artistic side, and how the things I make have always meant more to me than even my [miraculously] slightly above average score on some really hard PChem exams (miraculous because if you asked me what a wavefunction is now, I’d probably just try to draw Schrodinger’s Cat). I finally felt I had a reason to acknowledge it, and perhaps, make something of it. Anywho (I’ve learned that my biological maternal grandmother used this segway as frequently as I do…), discussing what art and the process of creating art does to us has become a defining characteristic of our most unique and special friendship. She has offered much advice, and as my finest artist mentor, has played a large part in my decision to see what comes of a full-time existence in the art realm. I am ecstatic and eternally grateful to learn about and know her, and so thankful that because she is who she is, my right-brain is now much better lit. I can keep going, but for the sake of brevity and saving some for later, I’ll call it a night. PS: Sincerest apologies for the cheesy title. Reading this story brings a huge smile to my face! This was very touching. It must have been a life-changing experience to see her work for the first time! Thanks for such an inspiring post. Thank you, Heather! The whole experience has been incredible, and seeing her beautiful art has been a most welcome bonus :). I am so glad for you. You are finding more answers and that must feel wonderful. 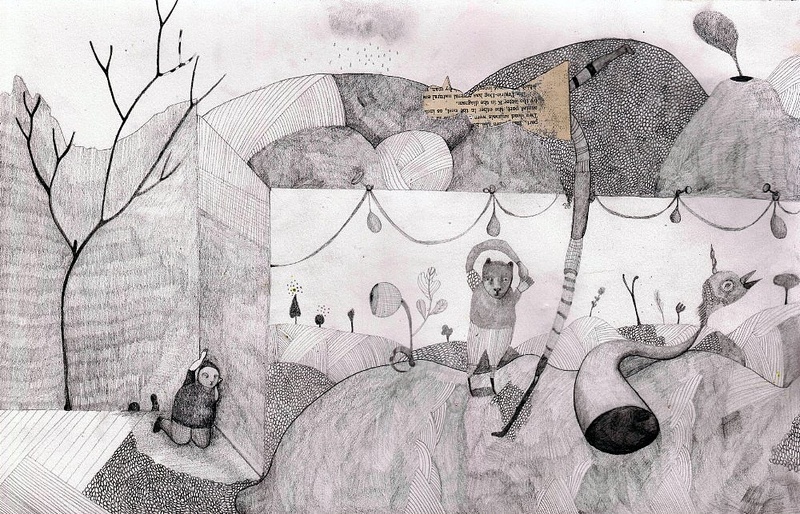 Yes, Laura’s drawings are amazing – what worlds can come from a pencil and paper! Somehow that DNA gets passed along – my late brother was a wonderful artist. Genetics are a funny thing (and so intriguing)! Thank you so much for the kind words.